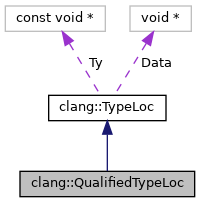 Wrapper of type source information for a type with non-trivial direct qualifiers. Currently, we intentionally do not provide source location for type qualifiers. Definition at line 270 of file TypeLoc.h. Definition at line 288 of file TypeLoc.h. Returns the alignment of the type source info data block that is specific to this type. Definition at line 306 of file TypeLoc.h. Returns the size of the type source info data block that is specific to this type. Definition at line 298 of file TypeLoc.h. Definition at line 272 of file TypeLoc.h. Definition at line 292 of file TypeLoc.h. Definition at line 274 of file TypeLoc.h. References clang::TypeLoc::Data, clang::TypeLoc::getLocalAlignmentForType(), and clang::TypeLoc::getTypePtr(). Referenced by clang::TreeTransform< Derived >::TransformTypeWithDeducedTST(), and clang::RecursiveASTVisitor< CallGraph >::WalkUpFromQualifiedTypeLoc(). Initializes the local data of this type source info block to provide no information. Definition at line 284 of file TypeLoc.h. Definition at line 312 of file TypeLoc.h.